There are cases where spacecraft integration requires an access hole thru the payload mounting interface. This access may be required for instrument integration, propulsion integration, spacecraft wiring … etc. To provide a scale of the size of the Flotron represented in the image below, the available payload swing diameter (as measured from the rotation centerline) is Ø110″ and the ID of the slew ring is approximately Ø54″. 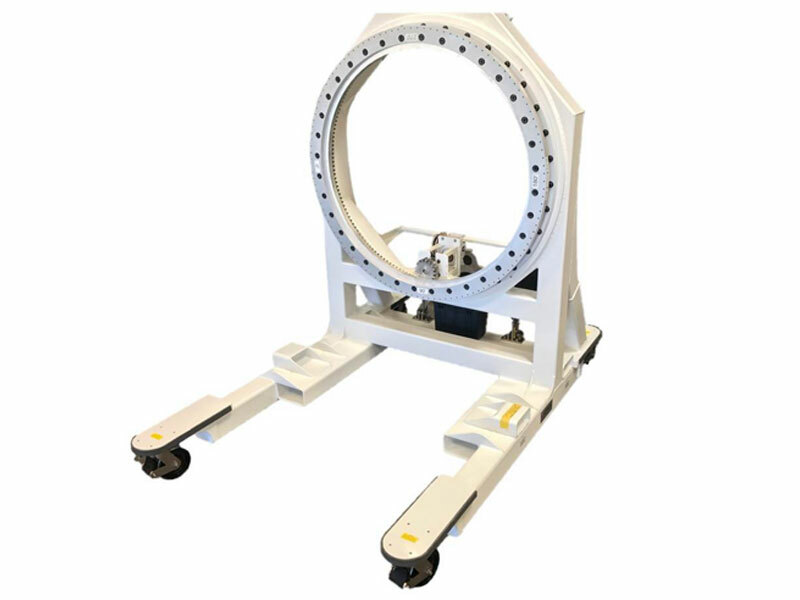 This cantilevered satellite integration fixture can support high moment and radial loads considering SFy = 3 and SFu = 5 in addition to a simultaneous (horizontal and vertical) dynamic loading condition. The resultant stability (with payload integrated) is 0.75G. The payload can be rotated 360° either by hand crank or by interfacing with a socket and electric hand drill. The gear drive is self-locking and non-back-driving with minimal backlash and the index plate on the input shaft can be physically pinned. The payload mounting interface dimensions and tolerances were specified by our customer. The finishes are compatible in a CLASS 10K clean room spacecraft manufacturing environment (no zinc, tin, or cadmium) and the lubricants were selected for compatibility. Covers were added over the geared slew ring and pinion gear to eliminate pinch points and to mitigate lubricant migration. The operator can maneuver the Rotation Fixture by the push bar or the tow bar. Forklift tube pockets have been incorporated at the rear to lift the Flotron (with the payload integrated) as well as at the side to handle the empty Flotron. The caster wheel material and geometry were specified to optimize rollability. Additional features include leg bumpers, relevant caution labels, angular indicator labels, and a storage container. Flotron fabricated a 2X proof load test simulator that represents 200% payload weight, 200% resultant moment and 100% torque. Flotron performed a proof load test with the payload simulator integrated when supported by the casters as wells as when lifted with a forklift. Weld inspection of critical welds (as defined by Flotron Engineering) was performed using an Eddy Current inspection method through the powder coat finish. The spacecraft mated to the Flotron fixture, all features were exercised to the delight of our customer and it is working excellent! Thank you again for the fine craftsmanship that your team delivered on.